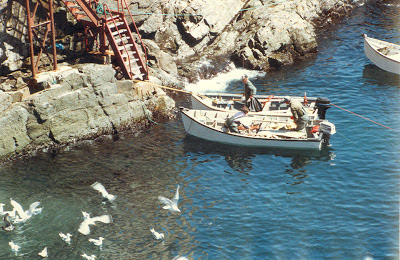 Ed McIntyre suggested this trip when he, Bud Peck and I stood near the ferry slip in North Sydney, Nova Scotia on an earlier tour of the Maritime Provinces. 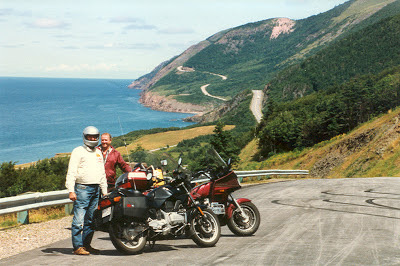 The highlight of that tour was the Cabot Trail on Cape Breton Island. We rode the beautiful twisty highway all the way around the perimeter and saw the many seacoast villages whose economy is based primarily on fish and lobsters. 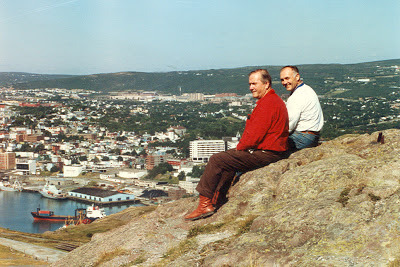 Remembering the two years I spent in Newfoundland in the early 1950s, my first reply to Ed's suggestion was, "What would anyone want to go to Newfoundland for? It's rainy and cloudy all the time and the wind blows constantly,” which I recalled from my Air Force tour there during the Cold War. On the rare occasions the rain let up, and the wind stopped blowing, we couldn’t see for the fog. Actually it rained for a total of only about four hours out of the seven days that Ed, Bud and I spent in Newfoundland. We also had strong winds only once, which was near Stephenville where I was stationed. I saw a road sign near there during our trip that warned of winds in excess of 200 kilometers (125 mph) having been measured along that section of the Trans-Canada Highway. We saw fog only once too, and that was miles out at sea on the Grand Banks, off the southern tip of the Avalon Peninsula. Several native Newfoundlanders told us that it was the most extraordinary summer they had experienced in 30 years. We arrived at the ferry slip in North Sydney in the early evening of the day before our ferry reservations. We allowed plenty of time for loading, although space for a few motorcycles would usually be easy to find. The huge ice-breaking bow of the seagoing ferry was raised up and out of the way as the cars, trucks and campers entered through the gaping bow section onto the vehicle deck. On our return trip, a week later, we loaded in a similar fashion but from the stern. The total fare for a bike and rider at that time, in the mid-1990s, was $30 in Canadian currency. A seagoing ferry has never been my idea of fun, but the MV Caribou made the 4½ hour trip from North Sydney to Port-aux-Basques, Newfoundland as pleasant as any sea voyage could be. Having an extreme inner ear sensitivity, I took Dramamine both ways, in spite of advance reports of a calm sea. I remembered the rough crossing I made in 1953 on a much smaller predecessor of the Caribou, which was rough. 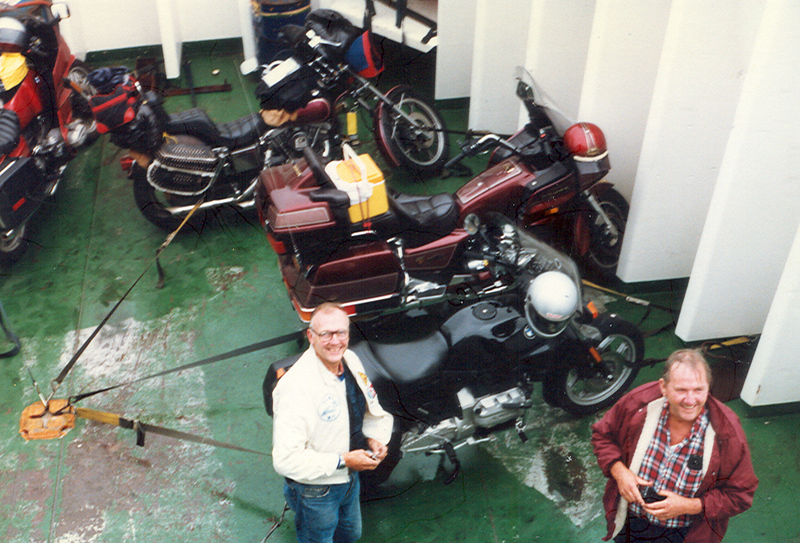 After riding the bikes up the steep loading-ramp onto the ship, we were directed to a rear corner of the top vehicle deck. They provided more than enough tie-down straps to lash the bikes down. One strap would have been sufficient in a calm sea, but because of recollections of my earlier trip, we used four straps on each machine. Due to my inner ear problem, I declined the ship's dinner menu, which was very tempting, and the prices were right. The onboard theater presented a double-feature movie while a musical group sang “Newfie” folk songs in a well-stocked lounge. Many passengers strolled the decks, keeping an eye out for whales, while others snoozed in reclining chairs on the decks. Staterooms were available at an extra charge, primarily for night crossings, but a few hours sleep is the most you could hope to get. I was sure that my predictions about the weather had come true as we approached Port-aux-Basques. We could barely make out the rocky shoreline through the light rain and mist. The captain did an expert job of piloting the huge ship into the tiny harbor. The ship cleared the craggy rocks on both sides with only a few feet to spare. After slowly entering the harbor, the captain turned the huge ship 180° around, and then he backed it in toward the dock in an area so small, you had to see it to believe it. Disembarking also went smoothly, in spite of a steep ride down the wet steel ramp. Our motel reservations were nearby in the town of Port-aux-Basques; so when we arrived, we had less than a five-minute ride in light rain to reach our room. Traffic on the ferry crossing is said to be up 30 percent from the previous year, and growing at a phenomenal rate. The population of many towns in Newfoundland has increased several-fold since I was there in the early 1950s, which was due primarily to the opening of the Trans-Canada Highway across the island almost ten years after I left. The highway begins at Port-aux-Basques near the south-western tip of the island and passes through the forests of western Newfoundland past Corner Brook and Deer Lake before crossing the sparsely populated northern expanses where it also passes the once-famous Gander Airport on its way to the more populated and scenic areas of the rugged Avalon Peninsula. The Trans Canada Highway ends at St. John’s, the capital of the province. I remember traveling that route in 1953 on a narrow gauge railway with my family, aboard a small steam-powered train that was affectionately known as the "Newfie Bullet". Our car and house trailer traveled on a flatcar aboard the same train. The current highway is mostly two lanes across the sparsely-populated areas, with an extra lane for passing on most of the long hills. It becomes four lanes in the busily traveled, populated areas, like between Stephenville and Corner Brook, and also while nearing St. John’s. It was being upgraded in several areas while we were there. The speed limit in most areas was 90 kilometers (56 mph). We had very light traffic all the way, on the entire route from Port-aux-Basques to St. John's. Was once the Air Force Base hospital where my daughter Donna was born. Our first stop was Stephenville where I spent most of my Air Force tour. The US Air Force is gone now and Ernest Harmon Air Force Base no longer exists. All US military personnel pulled out in 1966, after a 25-year occupancy as part of our defense and early warning system (the "DEW line") during the Cold War. I recognized many of the main buildings, although the base chapel has become a Zion Pentecostal Church and the officer's club is now a popular local lounge. The base hospital where Donna was born, houses the Harmon Corporation. The airstrip, one of the longest in eastern Canada, is still in use, although most of the parking aprons and taxi strips are huge paved expanses. We drove in across a large area of concrete where painted lines now mark the vehicle travel lanes. The town of Stephenville has grown at least tenfold since I was there. It apparently now derives its economic dependency from a large modern newsprint mill, operated by Abitibi-Price. Fishing still accounts for a portion of the economy, but not as much as it does with other smaller towns that we visited during our tour. Our next stop was Gander Airport, once called the "Crossroads of the World" because of the massive amount of air traffic that passed through before jets with longer travel ranges bypassed this once-essential refueling stop. After checking into our motel and having dinner, we rode to the airport and saw a single 45-year-old PBY-5A Catalina flying boat fire up its engines and taxi out for takeoff. In spite of its civilian colors, seeing and hearing it brought back memories of flying in the lovable old birds during my Navy days in World War II. My most memorable incident while flying in a PBY happened while we were landing at an extremely short runway in Cebu City, in the central Philippines. We went clear off the end of the runway and got stuck in the mud. Local residents at Gander told us that several eastern European airlines still use Gander airfield regularly. 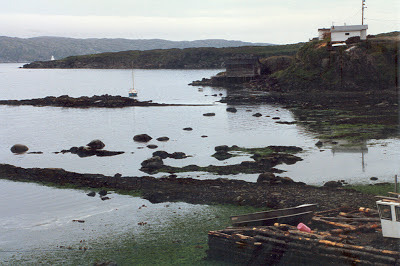 The next day we rode north to Musgrave Harbor on the Atlantic Ocean where the seacoast is rugged and barren. Bud's rear tire went flat after hitting a rough break in the pavement on our way to the lighthouse at Cape Bonavista. After quickly plugging the hole, we used the Gold Wing's “onboard” compressor to re-inflate the tire, and we were on our way in just a few minutes. A few days later, Ed’s rear tire went flat after hitting a similar road hazard, and we did the déjà vu thing with Ed's tire. 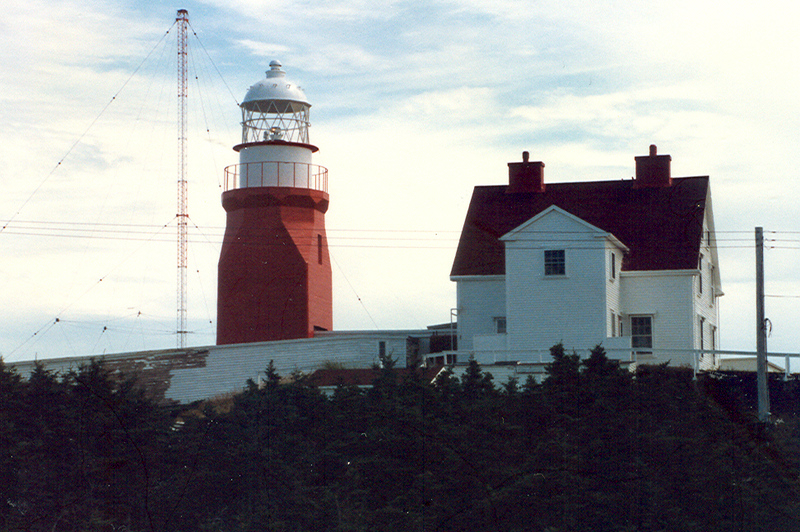 The Bonavista Lighthouse has been converted to a museum so visitors can see how the lighthouse keeper and his family lived in bygone days, and how the light worked. A mechanism of heavy weights and reduction gears that slowly rotate the light is similar to an old clock mechanism, only much larger. This one requires manual rewinding every two hours. Cape Bonavista is where John Cabot landed in 1497 and declared to the King of England that he had discovered what he called the "New Founde Lande". Although the Vikings preceded him by more than 500 years, it didn’t seem to affect Cabot when he promptly claimed the land for the King of England. He was later rewarded ten pounds of sterling for his good deed. St. John's is known as the oldest city in North America. It has endured for half a millennium and has thrived as a major seaport for many centuries; first, for its fishing industry with visitors from many seafaring nations of the world, and later for Newfoundland's offshore oil industry. St. John's burned to the ground in the huge fire of 1892; but it was rebuilt and has grown many times larger, with homes spread out over the treeless hills for miles. Signal Hill stands high above the city, overlooking the harbor and the famous Narrows that provide access and shelter from the Atlantic Ocean. 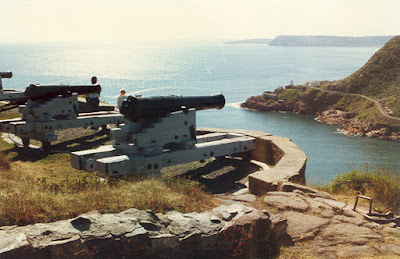 The old cannons, which once guarded the Narrows in battles between the British and French, still point menacingly toward the harbor entrance. The gun emplacements on Signal Hill, built in 1796, was once called the Queen's Battery. 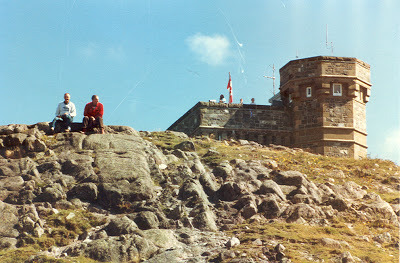 Cabot Tower, one of Newfoundland's oldest and most famous landmarks, stands majestically on the summit, and houses an interesting exhibit of Marconi receiving the first transatlantic wireless message. North of St. John's, we visited Pouch Cove, which was one of the highlights of our visit. We stood high above the tiny cove and saw fishermen unloading their morning catch as they filled a huge net with a few hundred pounds of fish from their deep, flat bottom fishing boats. The bulging nets were then hoisted 50 feet to the fishery level where they would be emptied and lowered again. A waste drain from the fishery spewed discarded fish parts out onto the rocky cliff where hundreds of hungry, screeching sea gulls fought for every morsel. 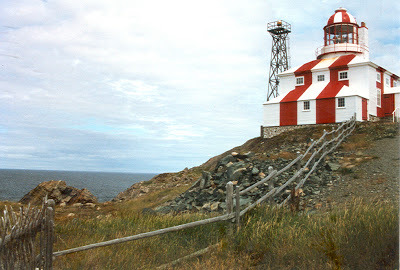 From there we rode on a rough, gravel road with ruts, holes and loose stones to the lighthouse at Cape St. Francis, perched precariously on the edge of a cliff above the Atlantic. Two workers were painting the steep side of the building using high ladders against a narrow ledge around the building. The older of the two clung to his ladder so tight, it was a wonder he could use the paintbrush. I asked him if he ever looked down. His face seemed a little pale when he answered that he tries not to. 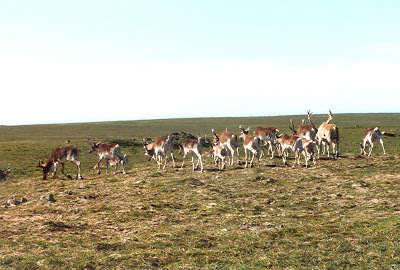 When we stopped for gas near Trepassey Bay on our loop around the Avalon Peninsula, we learned that the main herd of 2,000 caribou had been sighted recently near St. Shotts. So we made an 18-mile round trip into St. Shotts in hopes of seeing the herd, but it was already gone. We spotted it later, midway between there and Peter's River. With excitement running high, I quickly put the bike on its side stand and ran with my camera across the muskeg-like terrain, hoping to get close-up photos of the herd. At one point, I had caribou all around me. The largest rack I saw looked to be four feet high with many points. I got several pictures with and without my telephoto lens. The animals didn’t seem to mind my presence as they continued to graze. They would only occasionally look up to see what I was up to Newfoundland is the only place in North America where you can still hunt this beautiful animal, although the tags are very limited. On our return leg across the island, we visited Twillingate on the northern coast, and the lighthouse at Crow Head where we stood at the edge of a vertical cliff, hundreds of feet above the ocean to look for whales. Most visitors were content to stand behind a tall fence and look from there, but Bud and I walked out to the very edge, which gave me a rush of excitement. A voice yelled, "Whale", and sure enough one of the huge mammals surfaced briefly, directly below us, and blew water far into the air from its spout. We also visited St. Anthony, near the northern tip of the Great Northern Peninsula. It's the northernmost city in Newfoundland, and the home of the famous Grenfell Medical Mission where we saw a helicopter swoop in toward the a modern hospital while we were there. 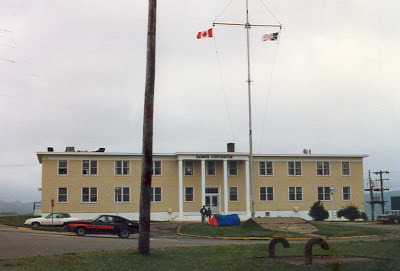 The hospital supports a large surrounding area, including remote Eskimo communities on the mainland, as well as from many other islands much farther north. We encountered the only significant rain of the trip in St. Anthony. We decided to skip a side visit to L'Anse-aux-Meadows, an archeological site of the first Viking settlement in North America, due to the rain. The site has been dated to around 1000 AD. It is widely accepted as evidence of Viking contact in North America before Columbus. On our return down the peninsula, along the Viking Trail near Eddies Cove, we saw a group of huge icebergs in the Strait of Belle Isle as they drifted near the Labrador coast on their way to the Atlantic. We also passed through Gros Morne National Park on our way to and from St. Anthony, which offers some of the most magnificent scenery on the island, with many majestic fjords, lakes and mountains. We saw a group of huge icebergs floating in the Strait of Belle Isle while we were returning down the peninsula near Eddies Cove. They appeared to be near the Labrador coast on their way to the Atlantic. Our last night in Newfoundland was spent at Plum Point on the northern peninsula where we enjoyed the best food of the trip in the small motel dining room. Aside from many identifiable items, they served a full menu of traditional Newfoundland dishes like, fish 'n brewis (cod fish with hardtack), cod tongues (a gelatinous bit of flesh from the cod's throat), cod-au-gratin (baked cod in an au-gratin sauce), scrunchions (pieces of pork rind), and other Newfoundland specialties. We found that the major difference with the food in Newfoundland was their over-easy eggs and breakfast sausages. The eggs were usually only served over-hard, no matter how we ordered them, and the sausages were always bland. Once during the trip, we stopped at a McDonald’s for breakfast, hoping to get their spicy sausages, but they served the same bland, almost-tasteless sausages. 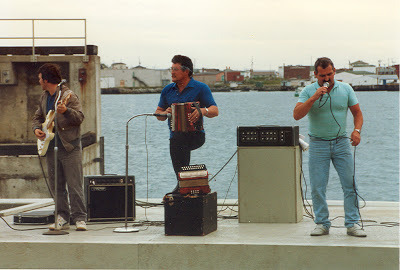 As we stood on the dock in Port-aux-Basques, a small musical group stood nearby singing Newfie folk songs like "I'se the Bye", which translates to "I'm the guy", and "The Squid Jiggin' Ground". (squid jiggers are special hooks for catching squid). Their music sounds a lot like a mixture of the Highland fling and the Irish jig. The performance seemed like a perfect end to a perfect visit. Most people on the island were outwardly friendly and hospitable toward us. It was normal for a stranger to approach us and start a friendly conversation. Whenever we asked for information it was always given with a smile. They laugh at the traditional "Newfie jokes" and will tell you a few right back. Newfoundland is aptly called "Canada's Happy Province."